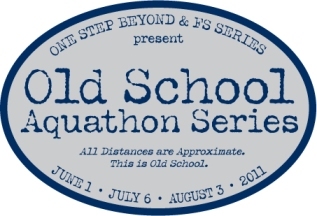 The Old School Aquathon series is in the books. We had pretty good turnout for each event and a lot of positive feedback from the racers. I hope we can host these again next year. Big thanks to FS Series and Inside Out Sports for supporting the races. As well as all the volunteer help from our Masters swim team and athlete base. Much appreciated! I snuck into the race unofficially and enjoyed participating, I have been jealous of everyone racing. I would write a blog post about our New England vacation but Bri has pretty much taken care of that one. Just read her blog. I am off to Atlantic City next weekend for some guy-time with my Dad and brother-in-law. Found out that the 40th annual Yates Swim is on Saturday evening so I will jump in that. It is a mile race that has been around longer than me, I swam it several times when I lived in NJ during the summers. I won't be as fast as back then but I am way smarter and better looking now.